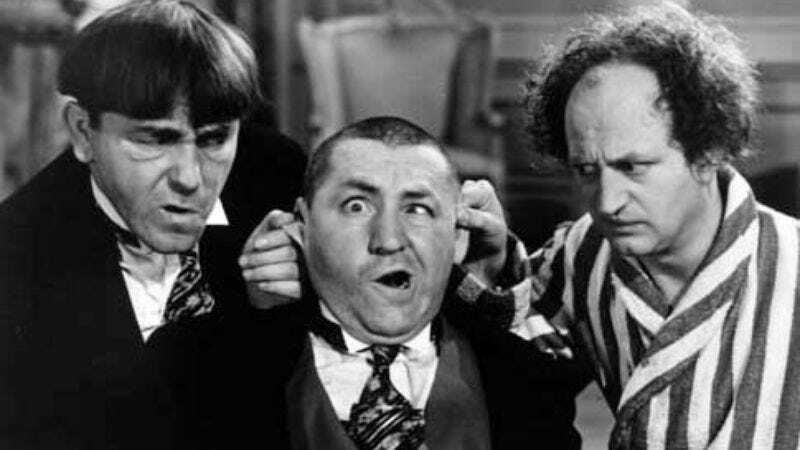 Posing the question of why characters should act their age when it’s easier to just make them younger, C3 Entertainment has a glorious plan to reboot The Three Stooges by taking the trio back to adolescence. Screenrant reports that the new film will star three 12-year-old actors as young Larry, Curly, and Moe, noting that Hollywood has been trying for years to reinvigorate the property and that the 2012 Farrelly Brothers film didn’t help matters one bit. Perhaps the fact that young males actually do knee their friends in the balls means this reboot will leave vaudeville comedy behind and instead serve as a more realistic We Need To Talk About Curly-type thriller about the threat of school violence. Barring such a drastic change in course, C3 is apparently unwilling to consider that perhaps the Stooges’ routine simply works better over brief intervals—like their original short films—than an entire full-length feature, or that children today probably don’t care about The Three Stooges and thus won’t be begging their parents to see this movie or to get bowl cuts the next time they visit the barber. It seems the only thing that can keep this from being a colossal misstep is a singular talent behind the camera. After all, this reboot would definitely be interesting if, say, Quentin Tarantino declared it his passion project. Currently, the film has writer-director Harris Golberg, who wrote Master of Disguise and Deuce Bigelow: Male Gigolo, attached. Okay, well, that’s that.